Although it is now possible to integrate many millions of transistors on a single chip, traditional digital circuit technology is now reaching its limits, facing problems of cost and technical efficiency when scaled down to ever-smaller feature sizes. The analysis of biological neural systems, especially for visual processing, has allowed engineers to better understand how complex networks can effectively process large amounts of information, whilst dealing with difficult computational challenges. Analog and parallel processing are key characteristics of biological neural networks. Analog VLSI circuits using the same features can therefore be developed to emulate brain-style processing. Using standard CMOS technology, they can be cheaply manufactured, permitting efficient industrial and consumer applications in robotics and mobile electronics. 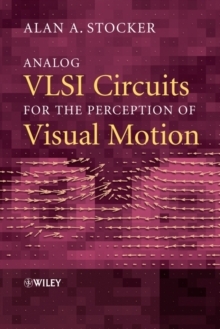 This book explores the theory, design and implementation of analog VLSI circuits, inspired by visual motion processing in biological neural networks. Using a novel approach pioneered by the author himself, Stocker explains in detail the construction of a series of electronic chips, providing the reader with a valuable practical insight into the technology. Analog VLSI Circuits for the Perception of Visual Motion:* analyses the computational problems in visual motion perception;* examines the issue of optimization in analog networks through high level processes such as motion segmentation and selective attention;* demonstrates network implementation in analog VLSI CMOS technology to provide computationally efficient devices;* sets out measurements of final hardware implementation;* illustrates the similarities of the presented circuits with the human visual motion perception system;* includes an accompanying website with video clips of circuits under real-time visual conditions and additional supplementary material. With a complete review of all existing neuromorphic analog VLSI systems for visual motion sensing, Analog VLSI Circuits for the Perception of Visual Motion is a unique reference for advanced students in electrical engineering, artificial intelligence, robotics and computational neuroscience. It will also be useful for researchers, professionals, and electronics engineers working in the field.